Put couscous into a bowl. Boil water and pour over couscous so that it is covered. Cover with cling wrap and set aside. In a bowl combine onion, cucumber, coriander, parsley, orange. When couscous has soaked up the water, fluff with a fork, drizzle with 2 Tbsp of olive oil and add into the bowl with the vegetables. Drizzle over orange juice and zest. Combine all ingredients. Best served chilled and will keep for up to 3 days covered in the fridge. 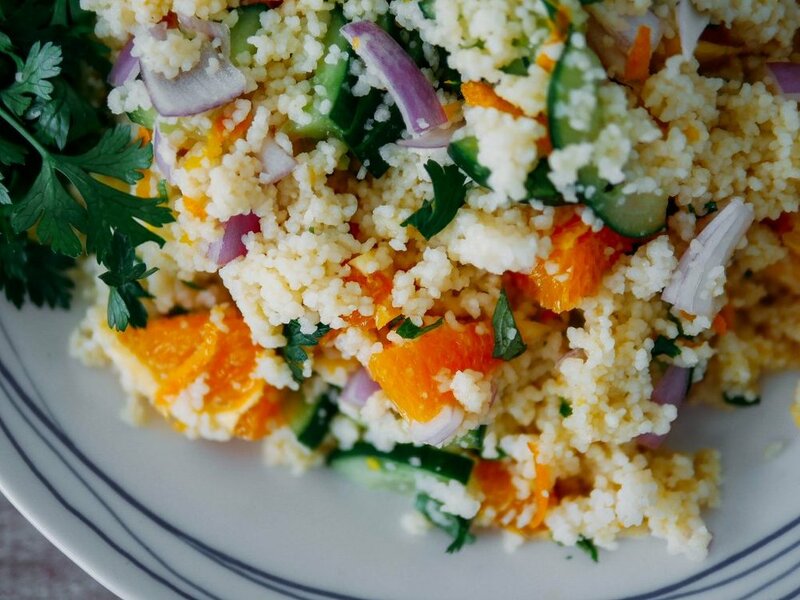 This Orange Couscous Salad is a fresh dish with so many bright and bold flavours like parsley, coriander, red onion, cucumber and orange. Light, fluffy couscous forms the base of this quick and easy meal, it is perfect to use in salads to bulk them up and make the salad more substantial and filling. This salad can be served as a main dish or alongside any grilled or roast meats. Oranges are now in season and this citrus fruit gives beautiful flavour to sweet and savoury dishes. Oranges are well known for their vitamin C content which is a powerful antioxidant, helping protect our cells from damage. They are also a good source of fibre, B vitamins, vitamin A, calcium and potassium. The peel contains higher levels of certain nutrients than the flesh, make sure you incorporate the zest into your cooking to give your meal added health benefits. If you are on the lookout for more orange recipes head to our friends 5+ A Day, they have lots of meal inspo!